ASUS unveiled brand new additions to its Designo Series range—the MS248, MS238, MS228 and MS208 LED monitors. These eco-friendly, ultra-slim monitors feature 16.5mm profiles and 20″ to 23.6″ displays that deliver uncompromised performance and mind-blowing visuals. The cutting-edge MS Series LED monitors deliver a benchmark 10,000,000:1 contrast ratio for more lifelike images. Retaining the binary state-inspired concept that incorporates the numbers 1 and 0 into an ultra-slim design, these LED monitors come with a glittering sapphire blue rear bezel. They also retain the original’s iconic Ergo-Fit Technology spherical ring stand that lets users adjust the monitor’s tilt angle with just one finger. Each of these mercury-free LED monitors reduce energy consumption by up to 45%*, and lowers annual CO₂ emissions by 23.6kg. Users will be treated to true-to-life visuals thanks to the exclusive ASUS Smart Contrast Ratio (ASCR) Technology, which enables the Designo MS Series LED monitors to deliver an industry contrast ratio benchmark of 10,000,000:1. LED-backlit panels provide flicker-free images, minimizing eye fatigue even after prolonged use. Full HD (1920×1080) and HDMI compatibility allows for high definition video playback while a 2ms (GTG) response time delivers crisp and sharp video. ASUS Splendid™ Video Intelligence Technology optimizes color fidelity with five pre-set modes (gaming, theater, night view, scenery and standard), fulfilling users’ visual needs with a touch of a button. The Designo MS Series LED monitors feature a sleek, ultra-slim 16.5mm form factor that saves users desk space, spelling the end of cluttered and cramped workstations. They also brighten up the drab image of monitors with colors that set them apart from other offerings on the market today—the MS Series front fascia comes with a high gloss piano-black finish and is partnered by a wave-contoured rear bezel finished in glittering sapphire blue. 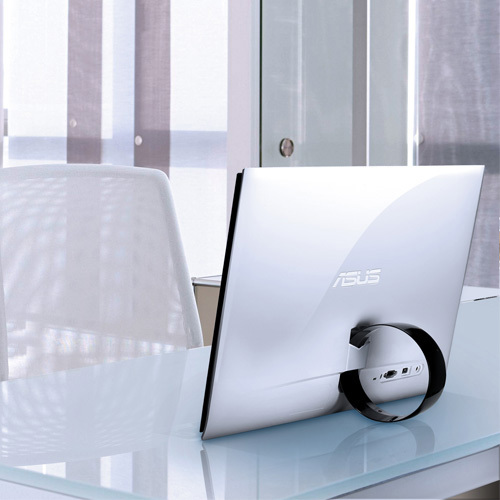 The exquisitely designed ring stand with ASUS-exclusive Ergo-Fit Technology allows for easy tilt angle adjustments with just one finger, ensuring that the monitor is always in a comfortable viewing position. The MS Series stands at a height equal to that of a notebook, and is ideal for those looking for a larger display to supplement their notebook. 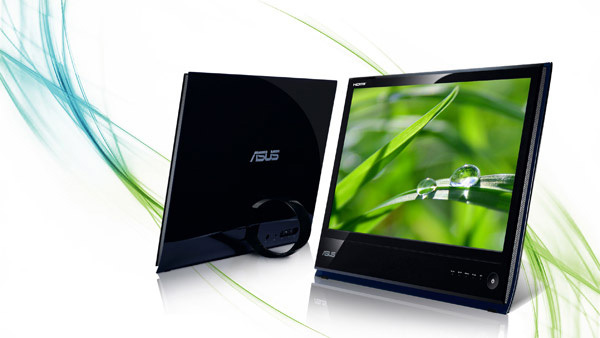 In keeping with ASUS’ green initiatives, the Designo Series LED monitors have done away with the use of bulbs, replacing them with eco-friendly, mercury-free LED backlit panels. These LED monitors reduce energy consumption levels by 45%, saving 37.2kWh of electricity and reducing annual CO₂ emissions by 23.6kg—the equivalent of planting 1.9 trees that can contribute two years worth of oxygen for a family of four.